Everyone says you eat with your eyes first and that to truly eat well, one must “eat the rainbow”. Generally I agree with that, however I have discovered that occasionally, an extremely tasty and complex meal is….well….beige. And while it may be bland to the eyes, that does not necessarily mean it’s bland to the taste buds. 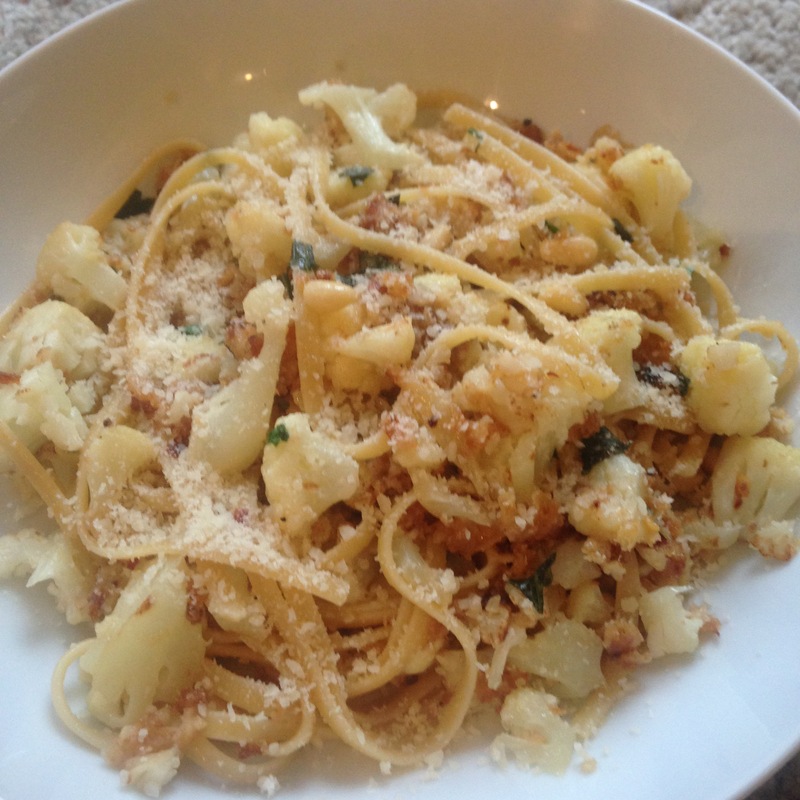 Case in point, Cauliflower-Onion Linguine. I know a lot of people who say they don’t like cauliflower. I believe them, but I certainly do not understand them. I am a great big fan of the cruciferous vegetable. What I discovered with this dish, is that if you add fried onions to the mix — oh my! It’s that little added bit of decadence that catapults this healthy dish right over and lands it smack dab in the middle of Incredibly Tasty Goodness Land. Cauliflower-Onion Linguine comes from Food Network Magazine and is super easy and incredibly quick, thanks to the store-bought fried onions. You might just spend more time cutting up the cauliflower than you will making the rest of the dish. Make this dish, set the table with your brightest, boldest linens if you must, but go ahead — embrace the beauty and enjoy the bounty of beige food. Bring a large pot of salted water to a boil. Add the pasta and cook as the label directs. Reserve 1 cup cooking water, then drain the pasta. Return to the pot and toss with 1 tablespoon olive oil. Meanwhile, heat 2 tablespoons olive oil in a large skillet over medium heat. Add the garlic and cook about 30 seconds. Add the panko and fried onions and cook, stirring, until lightly toasted, about 3 minutes. Transfer to a plate; wipe out the skillet. Heat the remaining 1 tablespoon olive oil in the skillet over medium-high heat. Add the cauliflower and cook until the edges brown, about 4 minutes. Add the red pepper flakes and toast 30 seconds. Add the reserved pasta water and cook until the liquid is reduced by half and the cauliflower is crisp-tender, about 1 more minute. Add the pasta, onion mixture and Parmesan to the skillet and toss. Season with salt. Top with the basil, pine nuts and more Parmesan. Weekly Winner: Cheating Condoned when it’s this Creamy, Cheesy, and Corny. This isn’t really even “cooking”. Seriously, if you can move a spoon around in a circular motion in a pan and boil some water, you can make this dish. If I’m being honest, the only preparation involved is tearing basil at the end. That’s it. 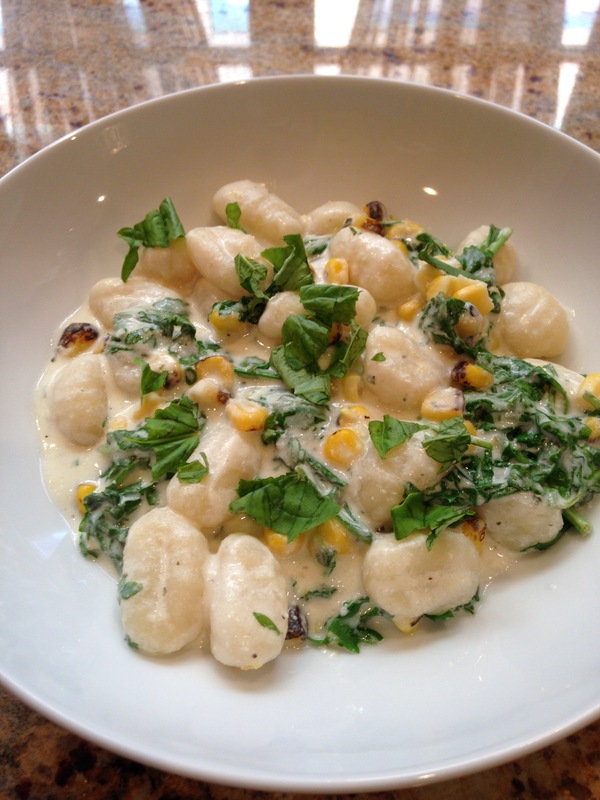 That is all I “created” when making Gnocchi, Sweet Corn, and Arugula in Garlic-Herb Cream Sauce. Everything else was, essentially already prepared. I just put it together. And I’m super glad I did. I’m home alone this week and I’ve got a fairly light cooking work load as well, so I didn’t feel like spending a lot of time in the kitchen making dinner just for me. But I wanted something luxurious and of course, delicious. That is exactly what this dish is. It literally came together in under 15 minutes. It seemed like it took longer for the water to come to a boil than it did to finish the dish once the pot did boil! So no, I don’t feel the least bit guilty naming this the best thing I made this week when, in essence, I didn’t really make it as much as assembled it. It just goes to show that sometimes simple is better and easy is not bad. It can be amazing. This easy, amazing cheat of a meal comes from Better Homes & Gardens. You have absolutely no excuse not to make this dish. For cream sauce: In a medium saucepan, add lemon juice, zest, half-and-half, cheese, and pepper. Cook over medium heat, stirring frequently for 10 minutes. Stir in reserved gnocchi cooking water. Pour sauce over gnocchi and corn; heat through. Stir in arugula and sprinkle with basil. Apparently I have found myself with a bit of a soba obsession. 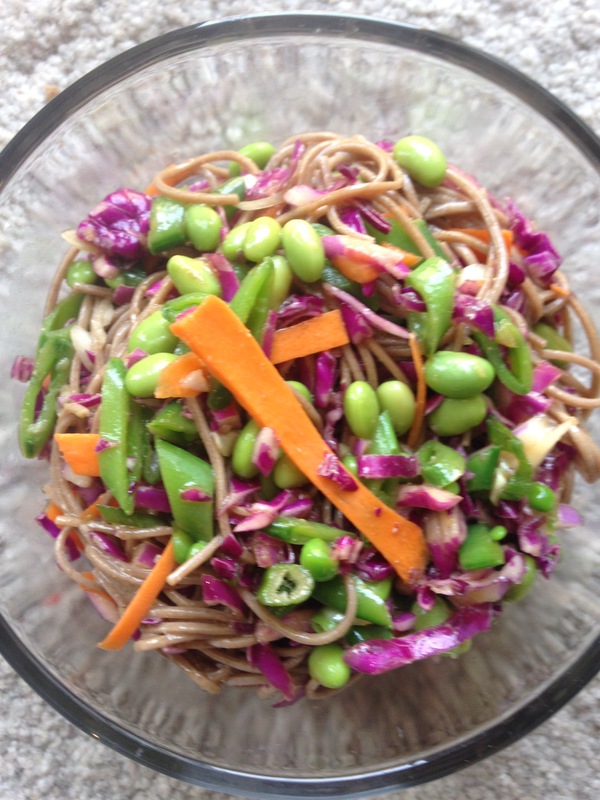 Last week it was the Pad Thai Salad and this week it’s this tasty Soba-Edamame Noodle Bowl. I guess it’s a sure sign that spring has sprung and my desire for lighter, healthier lunches has taken hold. Perhaps another reason I find myself gravitating towards these dishes is because there just seems to be something rebellious and decadent about eating cold noodles. That’s like sneaking into the fridge and swiping some of last night’s pasta straight out of the Tupperware (not that I’ve ever done that!!!). This, however is a civilized way to have cold noodles. And the addition of all the veggies makes it guilt-free whether it’s eaten out of a bowl at the dining room table, or nabbed from a storage container out of the fridge. The recipe for Soba-Edamame Noodle Bowl comes from Cooking Light. Besides being super easy to make, incredibly delicious to eat, and stupidly healthy for you – it’s also delightfully beautiful to look at. I mean seriously, check out all those colors! How can you see something that vibrant and colorful and not want to eat it? 1. Bring a large saucepan of water to a boil. Add edamame and soba noodles; cook 2 minutes. Add snow peas; cook 1 minute or until noodles are tender. Drain; rinse noodle mixture well with cold water. Drain. 2. Combine oil and next 6 ingredients (through salt) in a large bowl. Add noodle mixture, cabbage, onions, and carrots; toss gently to combine.